Some of you may know this about me, but I am a Marie Antoinette/French Revolution Junkie. I have always had a fascination about Marie Antoinette and that era. So, when I had a bit of a mysterious craving and saw Marie Antoinette, Serial Killer sitting on my bookshelf, how could I say no? After all, the blurb promises "heart stopping-suspense". Marie Antoinette, Serial Killer definitely quenched my suspenseful thirst. I was wanting something that would have me flying through the pages; Something that would give me a thrilling ride, and this novel gave me all 3 plus more! 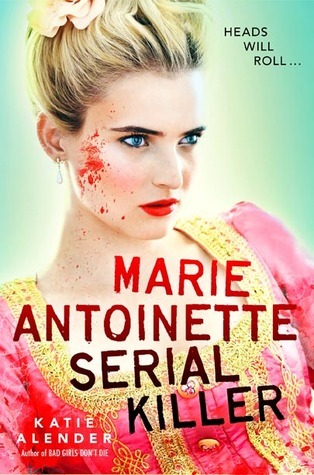 Let me start by saying that Marie Antoinette, Serial Killer is very character driven. In fact, it is probably mostly character driven. Yes, there is a wonderful, fast-paced storyline that teams up with it, but if not for these strong, perfectly crafted character, the story would have flopped. This was definitely one of the cases where I didn't that those qualities were unbalanced. Okay, maybe Hate is a tad strong, so we'll go with dislike. I loved that the author gives you such a stunning character cast, and makes them realistic. We don't like everyone we meet, so why should a book be any different, right? I was totally on board the Jules train! He was such an awesome character. He was sweet, kind and generous; That added to the swoon factor BIG TIME! Marie Antoinette, Serial Killer is the perfect book to curl up to by a fire during the cold days that are coming. You will devour this murderous, ghostly tale! And I promise you, you will be on the edge of your seat until the very last page!